Many people use “I’m not a teacher” as an excuse for not homeschooling. It’s a mentality they grew up with. I did too. I understand. I got out of it when I felt called to homeschool my children, slowly but surely. The Industrial Age has turned all of us into specialized professionals along the assembly lines of the world. Each of us has been instructed to take care of only one job and so we go through life assuming teachers teach, bakers bake, pilots fly planes and architects design. In fact, you CAN teach your child. You can! It’s as simple as picking up a teacher’s manual and reading the lesson the night before. 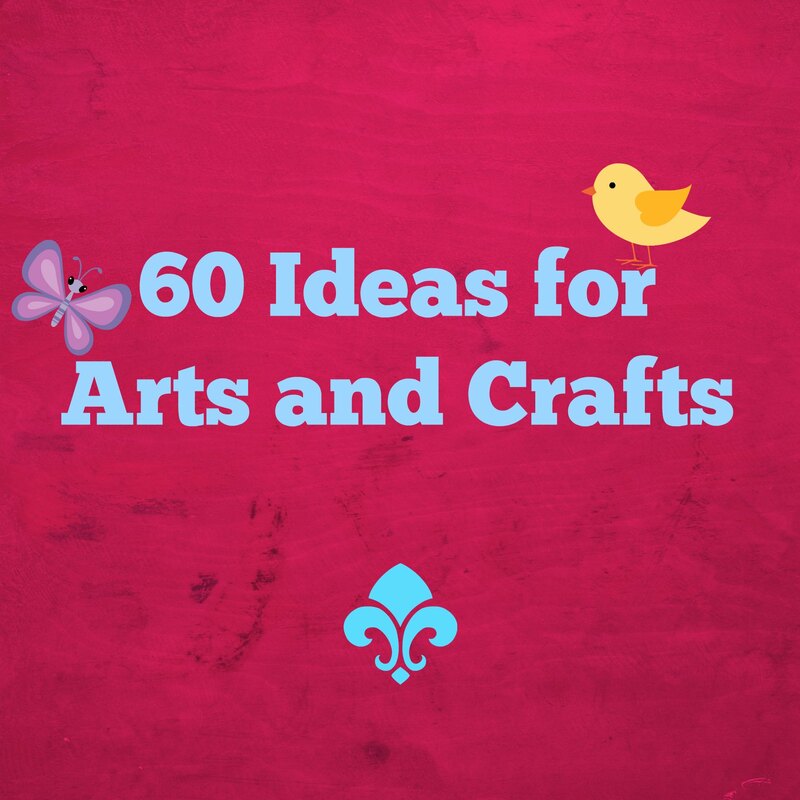 In this post, I am illustrating the point by giving you 60 ideas for arts and crafts. I’m no artist. My kids can draw better than I can. But I teach them art with the right tools. Even if you yourself are not that great at art you can teach your children art. To teach means to educate. And “educate” come from the Latin word “educare,” which means “leading out, taking somebody from here to there, guiding.” So you can guide your children through the process of discovering art. Take my case: I am not an artist, but I appreciate art. And, I discovered, it does not take much to expose my children to arts and crafts. 1. Visit your local Museum of Art. For us, it’s Arrowmont in Gatlinburg and the Knoxville Museum of Art. 2. Visit your local children’s museum. The closest one to us is in Oak Ridge and we have not been yet. I have only heard good things about it, but it’s just been a little out of the way for us. 3. Visit your local science and technology center. Check this list out to locate one near you. They are bound to have craft tables, among all those scientific projects. If you travel, it would make sense to invest in a membership. That way, you can visit everywhere for free. We got a membership at The Muse in Knoxville and have already visited another science center for free (the Discovery Center in Charlotte, NC). That’s what you can do any time you travel. 4. Visit your local natural science museum. They usually have programs and tours for children which end up with a craft. We go to McClung in Knoxville for their free stroller tours. 5. Visit your local artisan shops. Sometimes they have artist at work demonstrations. Exposing the children to the creating process inspires them. We go to the Arts and Crafts community on Glades Road in Gatlinburg – 120+ shops to explore. 6. Visit the National Gallery of Art website for kids and virtual shop. You will gain four things: knowledge, inspiration, ideas, and pretty things to share with friends and family. 7. Always have crayons and a drawing pad available for your children, whether at home or when traveling or waiting in a doctor’s office. My daughter has filled many pages of drawing during her brother’s violin classes. 8. Invest in a pottery wheel for children. You will have to get about five pounds of clay, too. We started with two pounds of clay and our two children used them up in one sitting and five projects. 9. Buy Sculpey – the greatest oven-bake clay there is. Once it’s dry, they can paint it. Or get colored Sculpey from the beginning. 10. Nothing beats Crayola’s air-dry clay. Always have some on hand. 11. The best art classes on DVD on the market – The Home Art Studio. 12. Discovery Kids sells a kit made out of wood with the solar system. They can paint or color each planet, the Sun and the asteroid belt, then hang them as a mobile. 14. Get art books from the library. 15. Invest in a few art books for children like the ones listed under #13. Or this one. Or this one. 16. Always have sidewalk chalk available at your house. It’s a great excuse to get them outside even on a cold day. 17. Take chalk projects to a new level by getting them a chalk kit which attaches to their bikes. 18. Play dough or modeling clay is a must, but always protect your work surface with a newspaper. Definitely don’t work with it on a carpet. Trust me. I know from experience. 19. Get books like Modeling Clay Animals. I made a giraffe for my daughter, which inspired her to try her own project. My mom thought my giraffe looked more like a horse, but hey, I tried, OK? 20. Draw Write Now – the series. You will refer to these books over and over again. If you want to teach manuscript, this doubles as a handwriting curriculum for beginners as well. We only do cursive, so I strictly use these books as art books – learning how to draw animals. After reading to them about mammals one day for science, we pulled out one of these volumes and learned how to draw a llama. 21. Watch Me Draw: Things Girls Love – need I to say more? 22. AquaDoodle pads are not just for smaller children. You would be surprised how busy any child will stay while drawing on an AquaDoodle pad. Get a smaller one for travel. 23. Photography is art. So invest in a child’s camera like V-Tech Kidizoom Digital Camera or let them have an older adult camera when Santa brings you an upgraded one. Show them how to use it and then how to download the pictures onto the computer. Delete blurry ones on the camera itself just to teach them how to keep their hands steady. 24. Deluxe art kit – for a birthday or Christmas gift, you cannot go wrong with this impressive set. 26. Lapbooks are art projects in and of themselves, but they can also learn anything under the sun with them. 27. Color Wonder markers, paints, finger paints, and books. Mess-free art – for kids under five, it’s a must. 28. Free coloring sheets on any theme are only a Google search away. 29. Paper roll crafts abound online, too. Pinterest boards will help you there, too. 30. Pipe cleaners are incredible. Here is a book to get you started on some pipe cleaner craft projects. 31. Read picture books to them since infancy. Exposing them to colorful and/of black-and-white picture books stimulates their imagination and gives them a personal collection of images that nobody can take away from them. I wrote about 1,000 Books Before Kindergarten here. 32. Take them to your local library story time. Your children will listen to stories, look at picture books and do a craft at the end. At least that is the drill at our local library. 33. Watch for free events at your local bookstore. I once attended a Pete the Cat day at Barnes and Noble. There were crafts and coloring pages for us to enjoy there after the reading. 34. Visit your local zoo. They usually have an indoor play area where the kids can enjoy crafts year round, but especially so around Christmas time. The price of an annual membership pays for itself in so many ways and having access to these arts and crafts is one of them. 35. Stickers are a wonderful way to develop creativity. Buy this set for animal lovers, this set for nature lovers, this set for car lovers and this set for music lovers. 36. Coloring T-shirts are a great hit with my daughter. I’m thinking there may be other kids out there who would enjoy painting on fabric. You can get this one which comes with an outline. Or, get plain white t-shirts and puffy paint or fabric markers and let them go to town. 37. Scissor crafts develop creativity AND fine motor skills, so definitely look into making chains of angels or snow flakes. Here’s a pair of scissors for small children. 38. Preschool books will always have artsy projects mixed in with math and literacy pages. We have used Horizons, Rod and Staff and a few others. 39. Your local church will always have Bible-related crafts at the end of your child’s Sunday/Sabbath School class. Many times the children are encouraged to create these projects and share them with friends and family as an outreach effort. Great way to train them to be little missionaries. 40. Invest in an art easel like this one. Take it outside on warm, dry days and let them paint the landscapes around your home. Hint: these masterpieces make great Christmas gifts for grandparents. 41. Trace their hands. Let them paint or color them and then cut them out. Have some available in a box at the ready. You can make these into so many cute crafts. You can glue them to a small bottle of hand lotion or any such small item as a gift for somebody special (like a violin teacher or a friend graduating or performing in a recital). Write “You deserve a hand” on the cutout hand. 42. Trace their feet. Again, you can make their cutout feet into so many projects, from turkeys to robots. 43. Attend Summer Reading Program at your local library. Most will offer workshops on arts and crafts. My kids worked on collages one summer and I did not think they would like it, but they enjoyed it immensely. Not the first time I was wrong about my kids, of course. It goes to show that you never know what can inspire them. 44. Encourage them to draw their feelings. Talk about different colors. Would orange mean warmth? Would red mean anger? Would blue mean sadness? 45. Encourage them to draw during tough times, like when a grandparent dies. My son surprised us with a drawing one week after his paternal grandfather died. We did not ask him to do this. From what daddy shared, our son re-created the scene complete with uncanny details. I am sure it was therapeutic for him to record this event in his own way. 46. Decorate a Christmas tree in December. 47. Make turkey crafts in November, in preparation for Thanksgiving. 48. Make Christmas ornaments. Any medium is fine. 49. If your child attends a co-op, don’t skip the art class offered. 50. Attend craft time with other homeschoolers. Our local support group does not have a co-op, but once a month we meet at the library for craft time. 51. Follow the Fine Art Mom Blog. 52. Follow the Harmony Arts Blog. 53. Recycled arts – the sky is the limit. Sure, you can buy your own building blocks. But you can also, um, build them yourself, with your child’s help, that is. Paper grocery bags filled with crumpled up newspapers and sealed with packing tape make for wonderful blocks they can stack, build with, or even throw themselves on. 54. Build your own toys. We once made a train out of tea boxes. 55. Make Father’s/Mother’s/Valentine Day cards. Give them construction paper, crayons, stickers and scissors. 56. Always make a drawing as a thank you note for gifts received at Christmas and birthdays. 57. Make shoe planters out of old favorite shoes your child has outgrown. Your child can apply two coats of Mod Podge, then spray paint the shoes gold. After they dry, your child can add soil and plant mini carnations or other small plants. What a great gift for Mother’s Day! 58. Make a jelly bean American flag for Veterans Day by gluing read, white and blue jelly beans onto a cardboard. 59. Wood bird houses and any other wooden objects sold at craft store can be turned into painting opportunities. 60. If I still have not convinced you that YOU can teach your child art, pay for an art class. And there you have it, my list of 60 arts and crafts ideas. I hope this helps inspire you. I have only scratched the surface. This list could easily be called 100+ ideas and extended to contain 100+ ideas. But 60 should give you a good start.